Notes: Rare cover with additional 'National Trust for Scotland' meter mark. The above Royal Mail PSB: National Trust - Pane 2 stamps were issued on 25 April 1995 by Royal Mail and feature the following stamp designs: . 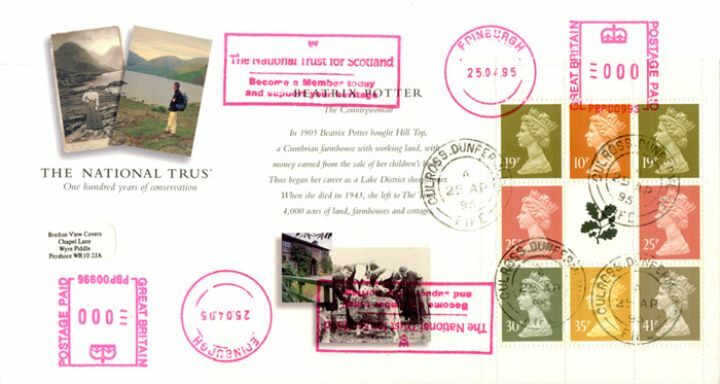 The The Lake District first day cover with the Culross CDS Postmark postmark has been produced by Royal Mail/Post Office and features these stamps which can make a very collectible and lovely gift.